While it is the intention of the Rand Desert Museum to have each claim posted in to the CLAIMS portion of each town this may not happen for some time while the mechanics of the Claims section are worked out. In the mean time we are posting that information here so that is available to you. When we get the CLAIMS portion of the web site up and working it will be much easier to conduct a search a specific claim or claim owner. Photo Showing Location of Belcher Extension Shaft. It was located in the hills directly behind the Coyote Mine on the west side of the town of Osdick/Hampton. It shows in this photo as the second from the left of the mnes identified. February 14, 1924: JOHN M. FOX HAS JUST RETURNED from San Francisco and Nevada, with orders to resume development on the Belcher Ex. No time was lost in getting the men. Drifting on the No. 2 vein on the 275 level is now to be followed, in the near future, by taking up the drift on the 432-foot level. 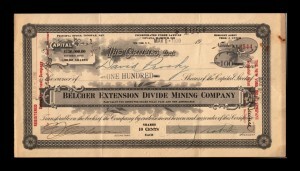 March 1925: “THIS PROPERTY, located to the southwest of the California Rand Silver Mine, is operated by the Belcher Extension Mining Company, Inc. The property is developed by a vertical, 1 ½ compartment shaft, 432 feet deep, and by approximately 300 feet of horizontal workings distributed between three level depths of 232, 332, and 432 feet. Three veins were cut in the shaft. These were prospected on the several levels and found to consist of vein matter similar to the silver producing veins of the district. Locally, they carried as much as 24 oz. of silver and 20 cents of gold per ton. May 15, 1925: “IT CAN BE SAID that since the Belcher Ex. Consolidated has resumed advancement is now being steadily their Reservoir lease, that they have been mining in a careful and practical way with results showing silver and gold values on their 432 level in the north drift. From their No. 1 winze, which is 200 feet deeper, advancement is now being steadily going on. For many weeks Tom Lynch has been on the ground and the saying goes that he handled every piece of rock that was sent up from below. Mr. Lynch is well versed in handling silver bearing rock—any Nevadan will vouch for that. June 9, 1925: “VIGOROUS DEVELOPMENT of the Williams vein in the Belcher Extension is proceeding from the 432-foot level, with rich ore continuing to show and the workings apparently entering an important body of shipping ore. 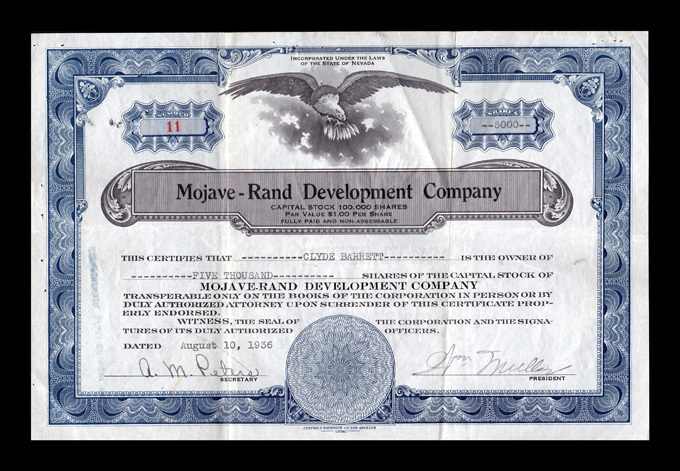 This work will soon enter the area leased from the California Rand Silver Company. Sinking of the winze to an approximate depth of 650 feet is also advancing. From the 632-foot level a drift will be sent out to cut the Williams ledge and seek other veins believed to traverse the lower areas.” –Bakersfield Californian. January 8, 1924: “ST. LAWRENCE MAY GET RUBY SILVER—Randsburg, Jan. 8.—On the third level of the St. Lawrence, in the drift some 700 feet out, they have good indications of hitting into some nice looking ruby silver. Pieces picked up on the dump this week show a decided change in the rock. The St. Lawrence Rand Mining Company holds a lease from the California Rand Silver Mining Company on portions of nine claims known as the K. C. N. Group, located approximately 4000 feet west of the California Rand Silver Mine. The property is developed by a number of old workings, and in addition an inclined shaft 450 feet deep. Levels are cut at 100 feet (240 feet of drifting); 250 feet, (772 feet of drifting); 350 feet (182 feet of drifting); and 450 feet (242 feet of drifting), for a total of 1436 feet of drifting to January 1, 1924. December 8, 1923: “SILVER BELLE LEDGE WIDENS FIVE FEET—F. 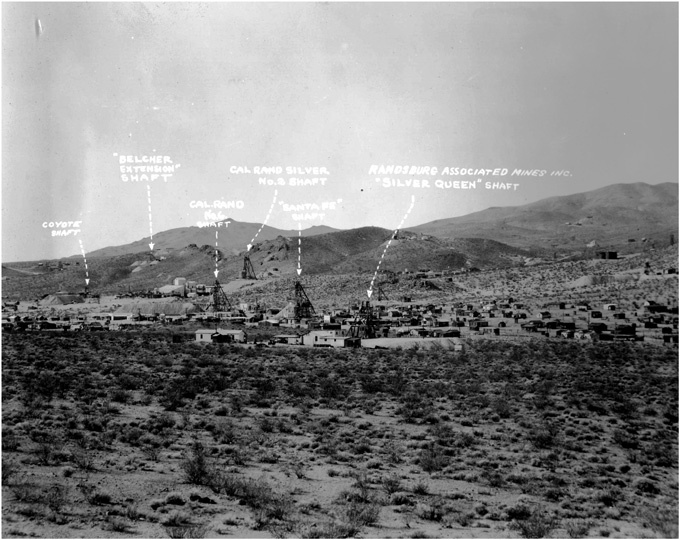 A. Burge, superintendent of the Silver Belle Mining Company stated this morning that the ledge on the Silver Bar claim of the Treasure Hill Mining Company in the Randsburg district, had widened to 15 feet and that the ore is running an average of $35 to the ton. The vein runs full length across the White Horse claim and officers of the company are now completing plans to sink a shaft to the 400-foot level. 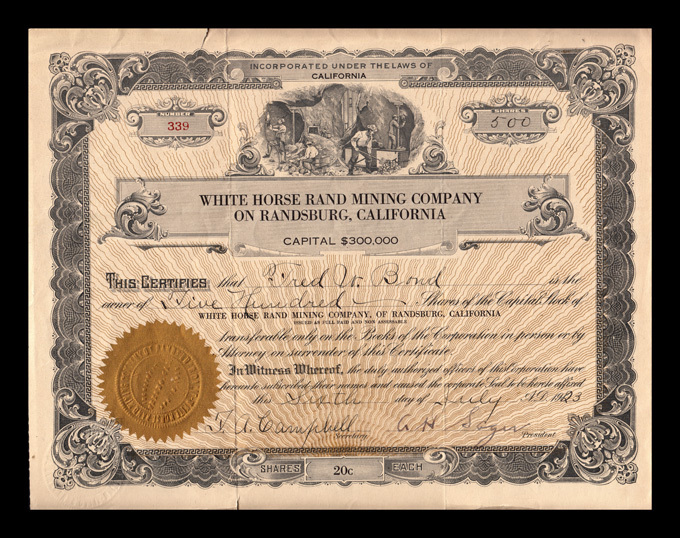 White Horse Rand Mining Company of Randsburg Stock Certificate. Collection of the Rand Desert Museum. 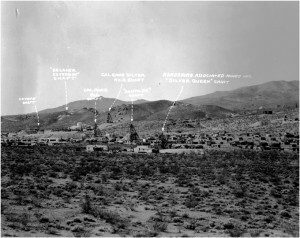 March 15, 1922: “VALUABLE ORE BODY IN MOJAVE RAND LAND –Randsburg, March 15. 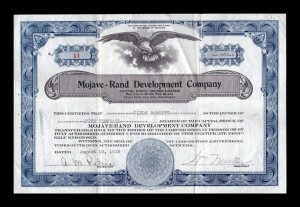 – An Assay received yesterday from the Mojave Rand property gave $185.20 per ton, of which $107.20 was gold and $75 silver. This high assay in gold indicates that the property will develop into a valuable gold mine, as well as silver. The shaft is down50feet and machinery will soon be installed for further sinking. Major Martin of Los Angeles is general manager of the property and the board of directors includes: Dr. Sherrary, W. D. Beatty, Dr. Jones, a geologist of note formerly associated with the Sun Oil Company, Dr. Beatty, Dr. Stukey, Mr. Phillips and Judge Stevens, all of Los Angeles. Dr. Sherrary is president of the company, and W. D. Beatty secretary and treasurer. SILVER KING GROUP Silver King No. 1, Silver King No. 2, Silver King No. 3 Silver King No. 4 and Lucky Fraction No. 2 Lodes. Mineral Survey No. 5695, Independence Land District, Claim Surveyed May 18, 1923, Claimed by Johannesburg Mining and Milling Co. Improvements consist of 7 shafts, 1 shaft crosscut and drifts valued at $29,615. 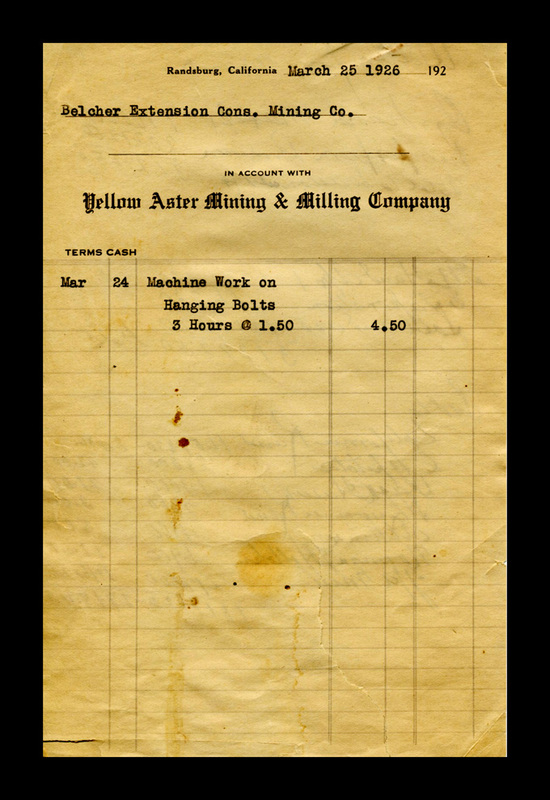 This entry was posted in Red Mountain, Red Mountain Mines. Bookmark the permalink.